Homebuyers in Horley are being invited to go along to a brand new show home opening at Langshott Park in The Acres this weekend. They can visit the five-bedroom Ellington on Saturday 29th and Sunday 30th June between 10am and 5pm to find out how much more they could get for their money with a Bovis Home. This super new show home has a number of exciting features to interest prospective Surrey buyers, including a fitted kitchen with integrated appliances, separate sitting room, dining room, and a master bedroom across the entire second floor with an ensuite. 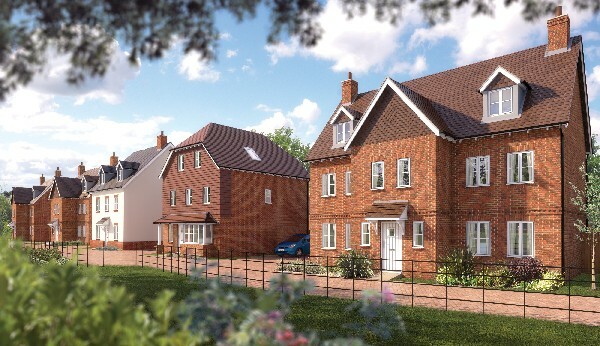 The Ellington showcases the quality of homes that will be available at Langshott Park. Homebuyers have a choice of new homes, ranging from two to six bedroom homes, and starting from £244,950 for a two bedroom Amberley. Bovis Homes creates contemporary homes built to traditional standards and their all-inclusive properties include new kitchens with integrated appliances and come with a 10-year warranty. They have been rated as a five-star builder by their customers for the second year running as part of a Home Builders Federation survey. To help buyers in securing their new home at Langshott Park, Bovis Homes offers a variety of purchase assistance schemes. Proving very popular at the moment is Help to Buy, where a 20% Government shared equity loan means you require a deposit of just 5% and get access to the competitive rates of a 75% mortgage. For those still struggling to sell their old place, Bovis Homes could help, and save time and money along the way. With Home Exchange we could buy your old home from you, leaving you free to move into a new Bovis Home, or choose Smooth Move, where we could pay your estate agents' fees when the house is sold. For more information about these and this development please call the sales team on 07785 316940 or visit www.bovishomes.co.uk. All prices correct at time of writing. Terms and conditions apply to all offers and purchase assistance schemes, customers should check www.bovishomes.co.uk for details.